PRODUCT: 6 inch Putty Knife. Nylon Handle, Polished High Carbon Tempered Steel, Full Length Riveted Tang, Solvent Resistant Nylon Handle with Hammer Head Design. Price/Each. MIRROR POLISHED, HIGH-CARBON, TEMPERED STEEL BLADE. FULL LENGTH TANG GOES COMPLETELY THROUGH HANDLE AND COVERS END. HAMMER-HEAD HANDLE HAS STRIKING HEAD FOR SETTING DRYWALL NAILS. 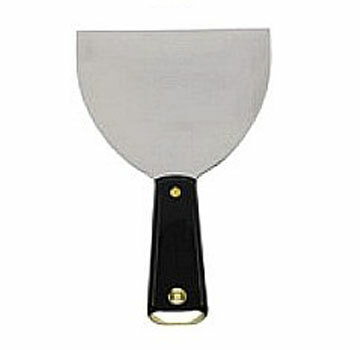 CAN BE USED AS SCRAPER, DRYWALL KNIFE, SPREADER OR PUTTY REMOVER.